Last December I made a resolution to eat breakfast every single morning beginning on January 1st, before I went to work and on weekends. I can now resolutely say that I have been underestimating the power of a good breakfast since the end of my elementary school days. Before then my mum would always have oatmeal, fruit, cereal or toast (always with a cup of tea) waiting for both my sister and I when we came downstairs in the morning. As it always seems to be I never appreciated the absolute gift that a breakfast prepared especially for you actually is; in fact the first luxury I would be interested in if I someday stumbled into piles of money would be a breakfast chef of my very own. Since a personal breakfast chef isn’t appearing any time soon on my horizon I have become a fan of breakfasts that can be set to cook or bake when I first get up and that are ready 20 minutes later, at which point I’m usually at least close to being finished all other pre-work preparations (steel-cut oats are another item in this increasingly important recipe category.) 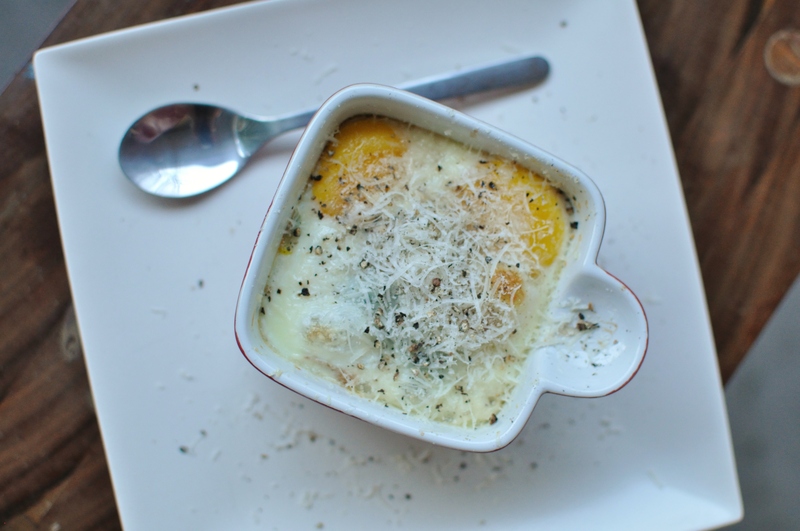 Baked eggs are a perfect example of this type of cooking: wake up, preheat oven, wash face, crack eggs into ramekin, add a small splash of cream and bake for 15 minutes or so until set but slightly wobbly. Usually during the week I’ll prepare baked eggs and an ingredient that can be added with little prep (fresh/dried herbs, grated carrot, diced sweet bell peppers or even leftover stir-fried vegetables are all good for this dish), other times I’ll have the eggs plain with buttered toast. However, if I wake up early and full of culinary motivation I might make these during the week but otherwise I tend to reserve these for the weekend. You could use prosciutto or pancetta in place of the Serrano ham if you prefer, I like Serrano ham because of its full flavour and sweet taste and I find that it doesn’t carry such a fatty flavour compared to other types of ham. I really adore baked eggs with buttered toast soldiers, there’s something to be said for the soothing action of dipping warm bread into the creamy yolks and repeating until gastronomically and emotionally satisfied that cannot be replicated with a bowl of Cheerios. 2. In a skillet sauté the Serrano ham and scallions in the grapeseed oil over medium heat until the ham begins to crisp. Take the skillet off the heat and stir in the spinach so that it begins to wilt. 3. Oil or butter the inside of 2 ramekins. 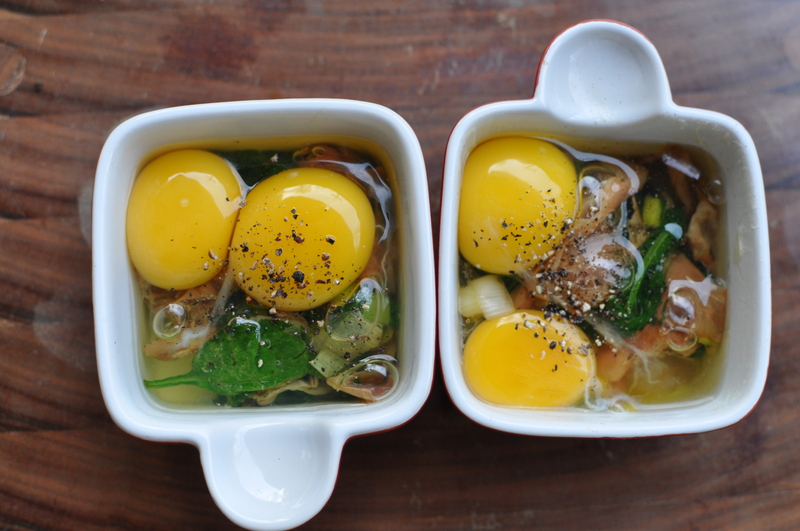 Divide the ham and scallion mixture evenly between the two dishes; into each ramekin crack 2 eggs and drizzle 2 tsp. of half-and-half cream. 4. Bake the eggs for anywhere between 10 to 20 minutes depending entirely on how well set you like your yolks, I usually bake my eggs for 15 minutes and then give them half a minute under the broiler if the tops are still looking runny. Dust the finished eggs with the coarse salt, freshly ground pepper and cheese before eating with buttery toast. I keep coming back to this album and almost always very loudly while I get ready to go to work for the day.